Having spent some time in Asia I'm well aware that if pineapples were even slightly less than delicious, nobody would mess with them. Bring one back from the market as a gift for your gracious hosts and you might get a polite smile and a reluctant sigh from the person who has to actually deal with it. 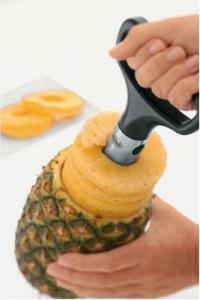 Where it's not a luxury, preparing pineapple is either a chore or a quick hack and slash that wastes most of the fruit. Considering all that, you may wonder how anyone manages to get those perfect doughnut shaped slices that you find in tasteless canned versions. With the Rosle Pineapple Cutter you can quickly reduce a thorny problem to a stack of beautiful cored slices, with all the flavor you only find in the fresh product. There is some waste involved. Cut open the rind that's left behind and you may think this is a terrible idea--there's a big chunk of fruit left over. Sure, you can do better with a knife and a lot of time, shaving the rind away strip by strip and cutting away a spiral V that connects every single fibrous core--the Rosle Pineapple Cutter seems like a very good compromise. It takes a little practice, but not much. Clean the cutter immediately after use, with a quick hand wash and dry. Pineapple is very acid and tough on stainless steel.